In my last entry for tennis Brothers, I ended by using the #onwardsandupwards. I have been trying to use that mentality in my tennis now that I am competing more regularly following my illness earlier in the year. In September I won a Grade 4 with my fellow Pershore Futures player Matt Sime. It has taken me longer to get back into my singles, but I am still getting my match fitness back by playing more match plays or tournaments. I finished 2018 on a really positive note by making my 1st singles final in 15 months on 16/12/18 (u16 grade 4 event). I didn't win the final but it was great to be competitive again! 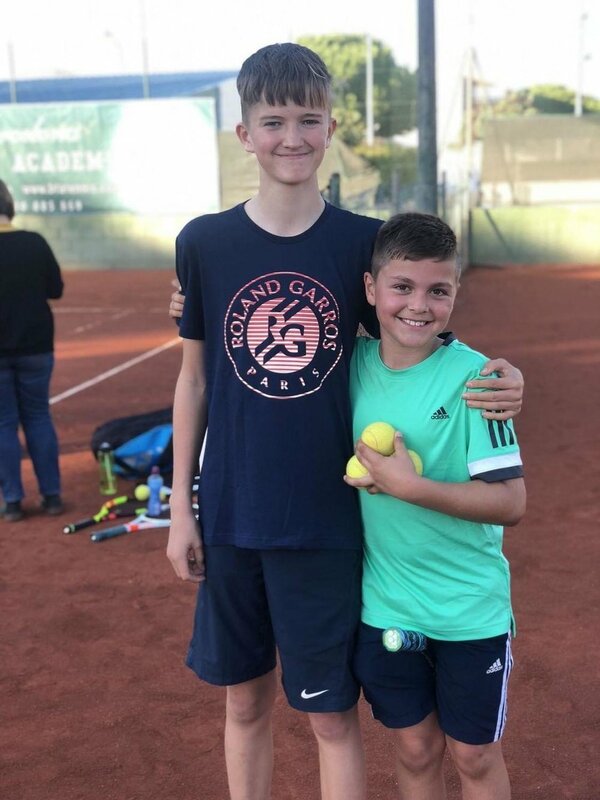 In this blog I want to write about being a good role model, because there are a lot of younger players at my club (Pershore Tennis Centre in Worcestershire). I want to display the right attributes and attitude on and off the tennis court. I know several of them look up to me and many others see me train on a regular basis. When being a role model you have to have positive qualities so that the people looking up to you will want to copy them. One of the main qualities is that you should have a good attitude on court. I learnt over the time I was ill that when petty things happen on a tennis court you don't need to get angry about them. Keep all the anger or frustration inside and march on through the match, showing a good attitude. This is certainly something that I am working on and giving 100% at all times. Before I was ill, I used to get annoyed with things such as bad line calls and silly mistakes that I made. This wasn't a good trait for me but then I realised that younger kids from my club were looking up to me, so I have been focusing hard on sorting my attitude out. The other important thing when playing lots of tennis is to have good routines. I use stretch bands, do warm up exercises and skip before matches to make sure I am prepared and that I don't get injured. And afterwards I stretch out too. Having routines is also good on court, for example, using a towel to help reset and looking at notes at the change of end to keep focussed. These are things I would pass on to younger players. I have recently been given a match journal by my parents (from FunctionalTennis.com). I have used this before, during and after my recent competitions and it has been a really useful tool for making sure I keep to my routines, bring my training level and good attitude to the match court and make notes to feed back to my coaches after each match. It's not only at my own tennis club that I feel I should be a role model. Another example of this is when I was training at Barcelona Tennis Academy (@barcelonatennisacademy on instagram) a young boy called Roman, aged 8, from Australia, became my friend. He looked up to me a lot (and his dad was very complimentary about me too). He watched me play and while I was there I'd say that he improved the most out of everyone. Having someone admire my tennis game as well as my on and off court attitude like this gives me confidence and helps me move forward in my tennis, making me aspire to get to where I want to be in my life. I have my own role models in tennis, especially Roger Federer, my coaches and my older peers that I have met whilst being at competitions over recent years. I have always sought advice from older players to learn and help point me in the right direction with my own tennis. I have read about how Roger Federer changed his attitude when he was younger and that helped him become the great champion he is today. I found this quote from an unknown author online: “I want to inspire people, I want someone to look at me and say because of you I didn't give up!” This quote sums up the kind of role model I want to be in a nutshell - to work hard, stay focused plus have a good attitude. Most importantly of all I want to make sure I have fun whilst doing all of the above! Over the past few years I have had some good support from the men's team captain at Pershore Tennis Centre, Dave Morris (@zentanogroup). He has been great in helping me learn how to control my emotions better on court. There can be a lot to deal with when playing tennis matches, especially singles, and Dave has helped me understand how to use triggers to create a positive outcome. I did some really interesting sessions with him using emotional profiling and performance profiling. Dave channelled some of the work he does with professionals in business and related that to aiding young athletes like myself. It was extremely useful and I have to thank Dave for being a good listening ear during my illness. I met with him while I had HSP and again recently during my recovery. Here Dave explains more about the sessions he did with me. They were very useful to me and inspired me to write about being a good role model for others, in tennis and in my life in general. Dave commented : “Sam's focus on being a role model is very important to our club so that we create the right environment for players to flourish. When I was a child with a number of challenges, my grandfather was a fantastic role model. He demonstrated the values, attitudes and behaviours that influenced the person I am now. My sense of purpose (what I do), my self-esteem (how satisfied I am with myself) and my ability to manage feelings are three vital things that my role model influenced in me. When I coached Sam, I asked him how he wanted to be perceived by others and why this was important to him. We explored what triggers his feelings of anger or frustration on court, we discussed the impact these feelings had on him, his opponents and others watching. We discussed ideas to overcome unhelpful feelings. Now 2018 is coming to an end. It was a tough year for my tennis and me personally. However at the end of the year I am ending on a positive note because I am going to get signed off from HSP disease. I can now go into 2019 full of hope and aspirations, continuing to work hard to achieve my goals in tennis and setting an example to the younger kids in around my tennis at home or in Spain.